A small collection of items relating to the famous Dam Busters, the dams raid 'Operation Chastise' and 617 Squadron. First we have a copy of Paul Brickhill's book about the raid, 'The Dam Busters'. H/b, 15 x 22cm, 269p, 1st edition 1951. It is signed 'S.L N. Richardson - Please Return'. Richardson was the man who introduced the Stabilizing Automatic Bomb Sight (SABS) to 617 Squadron in November 1943 when the squadron's Lancaster bombers were undergoing conversion to use Barnes Wallis's 12,000LBS 'Tallboy' bomb and required the higher accuracy of the SABS. Richardson is mentioned in the book - 'a day later a tall thin man with lively eyes walked into Martin's office carrying a bundle wrapped in oil skin and announced that he was Squadron Leader Richardson come to help 617 Squadron convert to SABS. This is it he said, carefully unwrapping the bundle. It's the loveliest thing in the world. The SABS looked like an ordinary bomb sight except that a bulky gyro was encased in it. Richardson handled it lovingly, and in the next few days we found out why. He was not a bomb aiming enthusiast, he was a fanatic who started talking bomb-aiming at breakfast and was still on the subject at bedtime. If he talked in his sleep no one doubted what the subject would be. He lectured the crews, flew with them, experimented with them and after a time no one had any chance of not knowing everything about the SABS. Bob Hay, haunted now by his own profession, christened him 'talking bomb'. Much of the credit for what happened belongs to 'talking bomb', who had been a pilot in World War 1 and managed in due course to fly on fifteen raids with 617 to watch his beloved bomb sight in action'. So the book is not just an autographed copy but 'Talking Bomb' Richardson's own unique personal copy, hence the dedication 'S.L. N Richardson - Please return!' 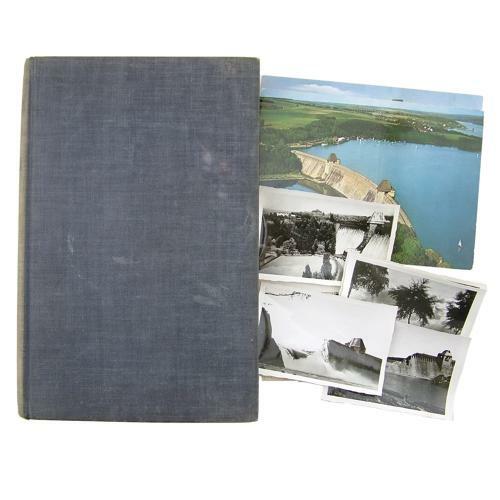 In addition to the book there are some original period photographs (approximately 6 x 9 cm) of the Mohne dam. One shows the dam in tact and two after it was breached. A couple more show views of the Mohne See and two modern (1970s?) postcards are of the rebuilt dam. An interesting grouping for anyone interested in the Dam Busters during this, the 75th anniversary of the raid. Stock code P22873-68.